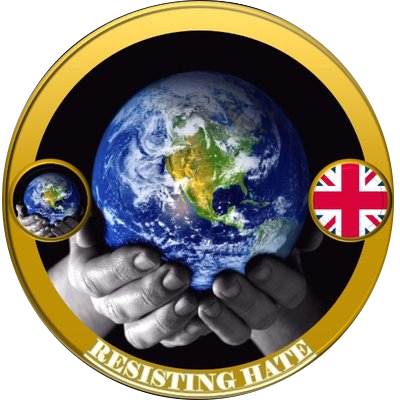 It is no secret that Resisting Hate wanted Tommy Robinson suspended from Twitter. It is no secret that we have encouraged and organised our members to report his hate tweets. 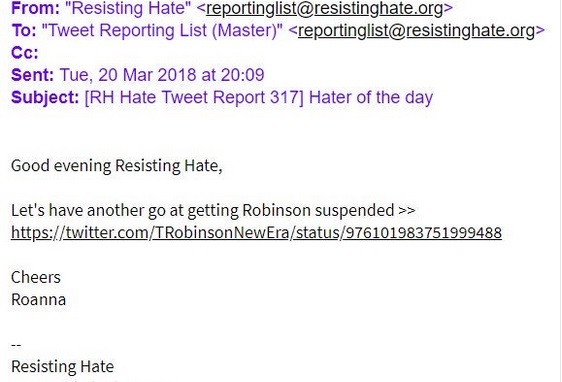 It is no secret that only last week we sent an email to 700 people asking them to report a tweet that we believed constituted hate speech and the breaking of Twitter Terms and Conditions. 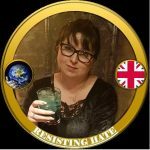 I openly published an article in the Huffington Post last week challenging Twitter on why this individual was allowed to preach hate against British Muslims and to put the safety of innocent people at risk. Well finally today it happened. Tommy Robinson was suspended from Twitter. This is only partly down to Resisting Hate – there were hundreds of individuals and groups reporting this man on a daily basis. When the haters are looking to place the blame it is likely we will be among those at the front of the queue. And I’m happy for us to take some of the credit – our members have reported Robinson day in and day out for weeks. But the truth is this isn’t a victory for Resisting Hate, this is the achievement of every individual who saw hate online and took the time to make their views heard. It is the voice of every decent person who wants a country where different communities and beliefs can co-exist peacefully side by side. This is a victory for the silent and peaceful majority. In some respects it isn’t even a victory. 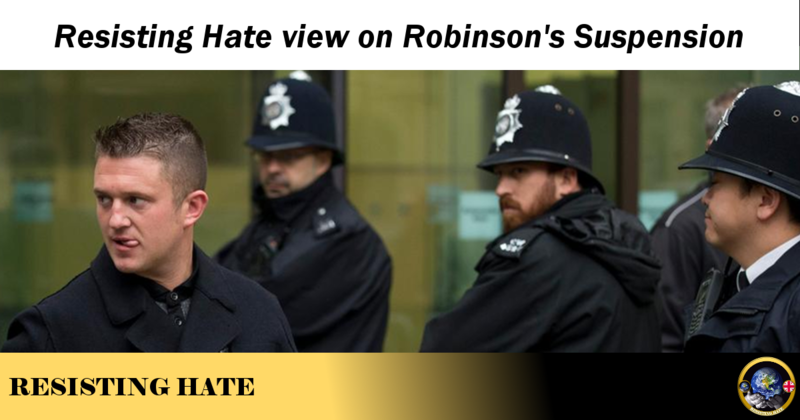 I would have preferred Robinson to be educated than to be silenced. A true victory is about winning hearts and minds, not shutting people down. I hope that there will come a day in the future when we don’t need to resort to censorship tactics to stop people attempting to radicalise one another into hate. Sadly that day is not here yet and until it is then Resisting Hate will continue to play our small and modest part in keeping social media free from hate.